MEDICINE HAT, AB – Medicine Hat Brewing is getting set to release the latest in its Stand Tall Series of beers inspired by local tales of bravery and heroism. There are a series of alphabetically arranged streets located in Medicine Hat, Belfast being one of them. This street was home to a war veteran who held a Major rank. When he returned home to Belfast Street from the war in the 40’s, he became an educator and eventually held a leadership role within the district. We dedicate this Stand Tall Series beer to the residents, old and new, of Belfast Street as well as our community’s exceptional educators who deserve the opportunity to stand tall. This is a smooth luscious dark ale with a medium light body. Brewed with 5 different American hops and copious amounts of leaf hops in our hopback, it has a fresh hop aroma & flavour with a medium dry finish. 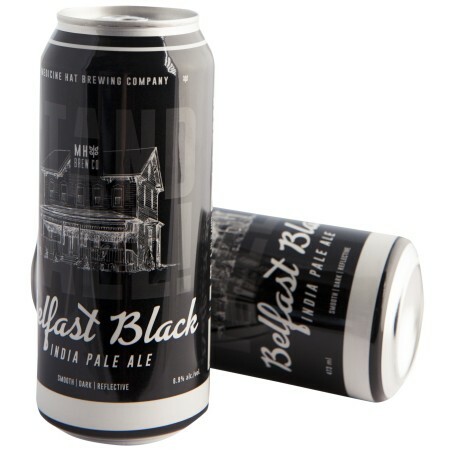 Belfast Black IPA will be released next Friday March 15th, and will be available in 473 ml cans and on draught while supplies last.